Appendix I.1. The lac operon control circuit. To feed E. coli growth, glucose undergoes a series of biochemical transformations known as glycolysis (literally, “sugar breaking”) followed by oxidation through the Krebs cycle. These transformations produce both precursors for building other cell molecules and high-energy compounds that provide the chemical fuel for a wide variety of essential cell activities. To metabolize lactose for growth, E. coli utilizes both glycolysis and the Krebs cycle but requires additional biochemical capabilities to convert lactose into glucose. These activities include an enzyme (LacZ) that splits lactose into glucose and galactose and a cell membrane protein (LacY) that transports lactose into the cell (Jacob and Monod 1961). While the enzymes for glucose utilization are present under most growth conditions, LacZ and LacY appear only when the bacteria grow on lactose (Monod and Cohn 1952). Thus, their synthesis is regulated according to nutritional conditions, and expression of the corresponding DNA sequences lacZ and lacY is subject to a control circuit that has been largely deciphered over the past five decades. Over the next two decades, additional control sites and regulatory proteins were identified: the CRP protein (cyclic AMP receptor protein) and its cognate CRP binding site, the lacP promoter which was the starting site for transcription, and two additional operator sites, one of which resides inside the lacZ coding sequence (Scaife and Beckwith 1966; Arditti, Scaife et al. 1968; Silverstone, Magasanik et al. 1969; Muller, Oehler et al. 1996). Expressing the lacZYA operon requires two proteins: (i) RNA polymerase that transcribes the DNA into a messenger RNA for further translation into LacZ and LacY proteins by the cell’s ribosomes and (ii) CRP (“cyclic AMP receptor protein”) which stimulates the initiation of transcription by the polymerase (Inada, Kimata et al. 1996; Kimata, Takahashi et al. 1997; Kuhlman, Zhang et al. 2007). Whether or not expression occurs is under the control of three additional molecules: (iii) the LacI repressor (I for “inducibility”) Willson, 1964 #964, (iv) an allolactose inducer molecule produced from lactose by the action of LacZ (Huber, Wallenfels et al. 1975; Huber, Kurz et al. 1976; Friedman, Olson et al. 1977; Turner and Huber 1977; Wu, Bahl et al. 1978) and (v) cyclic AMP (cAMP), a derivative of ATP that must bind to CRP before it can stimulate transcription (Inada, Kimata et al. 1996; Kimata, Takahashi et al. 1997). A key point is that the system works properly because lac operon DNA contains specific short binding sequences for LacI repressor (“operators” = lacO), for RNA polymerase (“promoter” = lacP) and for CRP (“crp site”). When there is no lactose (and hence no inducer), LacI binds to a pair of lacO sites and prevents RNA polymerase from gaining access to lacP, where it has to bind to initiate transcription of lacZ and lacY. When inducer is present, LacI binding to lacO sites no longer blocks polymerase access. By itself, polymerase recognizes lacP weakly, and physiologically significant transcription from lacP requires simultaneous binding of a complex between cAMP and CRP to the crp site (De Crombrugghe, Chen et al. 1971; De Crombrugghe, Chen et al. 1971; Nisseley, Anderson et al. 1971; Pastan and Perlman 1972). Interaction between CRP and polymerase stabilizes binding to lacP and thus enhances transcription (Savery, Rhodius et al. 1996). In the absence of cAMP, CRP cannot bind to crp. These binding sites for protein recognition (lacO, lacP and crp) must be properly positioned for all these regulatory interactions to occur correctly. In essence, they format the DNA for regulation and controlled access to genomic protein coding information. The level of cAMP in the E. coli cell is controlled by the availability of glucose in the external medium (Inada, Kimata et al. 1996; Kimata, Takahashi et al. 1997). Since cAMP is necessary for significant levels of lac operon transcription, it connects the regulatory circuit to recognition of one of the two sugars. The glucose control of cAMP levels occurs through one of the glucose transport proteins at the cell membrane (Harwood, Gazdar et al. 1976; Peterkofsky 1988). When glucose is available, the transport protein transfers a negatively charged phosphate group to the entering sugar, thus trapping it inside the cell and feeding it into the glycolytic process. This transport molecule is named “Protein IIAGlc” of the phosphotransferase system (PTS) discovered by Saul Roseman in 1964 (Kundig, Ghosh et al. 1964; Roseman 1969). The superscript “Glc” indicates that this particular PTS protein II specifically recognizes glucose (Simoni, Levinthal et al. 1967; Stock, Waygood et al. 1982). When there is no glucose available outside the cell, this protein accumulates in a form carrying an attached phosphate group, and this phosphorylated transport protein stimulates the enzyme that converts ATP into cAMP. Via this series of interactions, the cAMP levels inside the cell inversely reflect the glucose levels outside the cell. The glucose transport protein thus serves a dual function in both trapping glucose inside the cell and sensing extracellular glucose. Note, in a similar vein, that through the series of reactions leading up to derepression, LacY, LacZ and LacI repressor constitute a sensory circuit for lactose. Since this formulation of lac operon control circuits was elaborated several years ago, there has been a challenge to the role of cAMP and CRP in establishing diauxic growth (Crasnier-Mednansky 2008; Narang 2009; Narang 2009). The alternative explanation for glucose utilization prior to lactose consumption is the observation that glucose is able to inhibit transport of lactose into the cell by low uninduced levels of LacY permease. That interpretation fails to explain the observation that addition of cAMP abolishes the diauxic growth pattern (Perlman and Pastan 1968; De Crombrugghe, Perlman et al. 1969; Perlman, De Crombrugghe et al. 1969; Pastan and Perlman 1970). It may well be that the two regulatory effects reinforce each other, in a “fuzzy logic” manner (Kosko and Isaka 1993). Appendix I.2. S. cerevisiae pheromone response signal network (Sprague 1991). S. cereviseae a cells contain a dedicated Ste2 a-pheromone receptor in their cytoplasmic membrane which belongs to a large family of “heterotrimeric G factor-coupled” receptors (Blumer, Reneke et al. 1988; Nomoto, Nakayama et al. 1990; Josefsson 1999; Dohlman and Slessareva 2006; Koelle 2006; Slessareva and Dohlman 2006; Yin, Shumay et al. 2006). What this fancy name means is that the receptor binds to a three-subunit protein that hydrolyzes GTP and dissociates into its three separate components (Ga, Gb = Ste4 and Gg = Ste18) in response to receptor binding (Dohlman 2002). (The membrane receptor is called Ste2 and the G factor components Ste4 and Ste18 because mutants lacking any of them are sterile and unable to mate.) When a-pheromone binds to Ste2, the G factor dissociates and liberates a Ste4/Ste18 heterodimer (2 subunit protein). 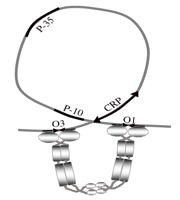 This heterodimer, in turn, binds to the Ste5 scaffold that holds three proteins that sequentially transfer a phosphate group in a widespread signaling system called a “MAP kinase (MAPK) cascade” (van Drogen and Peter 2001; Wang and Dohlman 2002; Wang and Dohlman 2006; Paliwal, Iglesias et al. 2007; Hu, Rappel et al. 2009). Each MAP kinase cascade works by transferring a phosphate group along a chain of MAPKKK (MAP kinase kinase kinase), MAPKK (MAP kinase kinase) and MAPK (MAP kinase) proteins which can then direct the phosphorylation process to other targets (Gustin, Albertyn et al. 1998; Mishra, Tuteja et al. 2006; Schwacke and Voit 2007) (Wang and Dohlman 2006; Chen and Thorner 2007) (Hu, Rappel et al. 2009). The Ste4/Ste18 heterodimer activates the protein phosphorylation cascade by stimulating Ste20 to phosphorylate Ste11 (MAPKKK) (Lee and Elion 1999), which then phosphorylates Ste 7 (MAPKK), which then phosphorylates the Fus3 MAPK molecule (Kusari, Molina et al. 2004). Fus3 phosphorylates and thereby activates the Ste12 transcription factor to stimulate mating function expression (Song, Dolan et al. 1991; Kirkman-Correia, Stroke et al. 1993; Chou, Lane et al. 2006; Esch, Wang et al. 2006)[Wong Sak Hoi, 2010 #6121]. Fus3 also phosphorylates and activates the Far1 inhibitor of the cell cycle function needed to exit G1 (Dolan 1996). Other less well characterized phosphorylations presumably play a role in initiating shmoo-like growth (Chenevert 1994; Chenevert, Valtz et al. 1994; Samaj, Baluska et al. 2004; Lesage and Bussey 2006; Arkowitz 2009; Aguilar, Heiman et al. 2010). Appendix II.1. Formatting the genome for transcriptional control. The distribution of the corresponding recognition signals through the genome falls correspondingly into a range of classes: some unique to one or a small number of loci, like lacO operators; some present at several to many sites, like the crp binding sites; and some very widespread, like the promoter sequences that direct RNA polymerase to the initiation site for transcription (Jaeger, Chan et al. 2010). Even widespread signals, like promoters, can fall into more specialized classes; these classes facilitate the expression of coordinated suites of coding sequences required under special sets of conditions, such as high temperature “heat shock” and other stresses (Wallrath, Lu et al. 1994; Arsene, Tomoyasu et al. 2000; Pirkkala, Nykanen et al. 2001; Hengge-Aronis 2002; Klauck, Typas et al. 2007). Special promoter signals are also utilized for the expression of complex functions requiring transcription of many coding sequences, such as cell differentiation. In prokaryotes, which have highly condensed genomes, transcription signals are often found within the protein coding sequences. For example, one of the three lacO operators is located within the lacZ coding sequence. Transcriptional control signals operate in combinations that facilitate regulatory interactions between the corresponding transcription factors. Several key regions of coding sequences hold the binding sites: the promoter area around the start site for transcription, the area around the termination site for ending transcription, and more distant locations that interact with the promoter area through DNA looping to bring them into proximity (Tjian 1995). These distant regions have received a variety of names (‘enhancer.” “silencer,” “upstream activating sequence”) according to whether they stimulate or repress transcription, but the term “enhancer” has found the most general application (Grimm and Nordeen 1999; Veitia 2008). Enhancers contain clusters of binding sites and are generally functional wherever they are located within distances of thousands or sometimes tens of thousands of base-pairs from the regulated coding sequences. In eukaryotes, which have interrupted coding sequences, enhancer elements, are often found in introns, which are spliced out of the final protein-coding messenger RNA (mRNA). Transcription control signals in eukaryotes assemble hierarchically into larger complexes that have been given the generic description of “cis-regulatory modules” (CRMs) (Ben-Tabou de-Leon and Davidson 2007; Hinman, Nguyen et al. 2007; Bonn and Furlong 2008; Ben-Tabou de-Leon and Davidson 2009; Ho, Johnsen et al. 2009; Li and Davidson 2009; MacArthur, Li et al. 2009; Zinzen, Girardot et al. 2009; Borok, Tran et al. 2010). These CRMs can extend for many thousands of basepairs in the genome and typically contain multiple enhancer regions that are independently active at different times in the cell cycle, at different phases or tissues of multicellular development, or in response to distinct stimuli. This hierarchical architecture facilitates the execution of complex regulatory algorithms in morphogenesis and of multivalent responses to inputs, such as DNA damage or binding of intercellular signaling molecules (Cooper, Loose et al. 2009). By analogy with the multivalent allosteric nature of proteins, the composite CRMs constitute a type of microprocessor element. Although protein microprocessors can function at different locations in the cell and thoughout the genome, the action of CRMs is typically limited to nearby regions of the genome and the coding sequences they contain. In combination, CRMs and the transcription factors they bind can generate an enormous variety of genomic responses to input signals. Transcription factors are dynamic proteins that regulate the expression of other transcriptions (and of themselves, as well) through binding to the CRMs adjacent to their coding sequences. These feedback interactions and the networks they form permit cells to construct complex regulatory circuits that process a large number of inter- and intracellular signals to compute an appropriate transcriptional response (Mangan and Alon 2003; Amoutzias, Robertson et al. 2004; Levine and Davidson 2005; Davidson and Erwin 2006; Madan Babu, Teichmann et al. 2006; Alon 2007; Balaji and Aravind 2007; Madan Babu, Balaji et al. 2007; Gonzalez Perez, Gonzalez Gonzalez et al. 2008; Aravind, Anantharaman et al. 2009; Hinman, Yankura et al. 2009). How these transcription factor circuits operate has been partially deciphered in certain model systems, such as the developing sea urchin, the progressive segmentation of the early Drosophila embryo and the establishment of anterior-posterior (AP) and dorsal-ventral (DV) axes in animal development (Nusslein-Volhard and Wieschaus 1980; Davidson and Erwin 2006; Erwin and Davidson 2009) and (De Robertis, Oliver et al. 1990; Nusslein-Volhard 1996). Appendix II.2. Natural genetic engineering in B lymphocytes for the rapid evolution and maturation of a virtually infinite diversity of antigen-binding proteins. Antibody structure. To clarify the discussion, it is necessary to describe some essential features of the antibody proteins and introduce basic terminology. I apologize to the reader for the proliferation of symbols, but that is inevitable when we have to deal with a system that has a virtually infinite number of outcomes. With a little patience, the description will all make sense and show how infinity is achieved in the real world of the B lymphocyte. The antibody structure consists of four protein chains: two identical short light (L) chains and two identical longer heavy (H) chains. Both L and H chains have a variable (V) region and a constant (C) region. The chains are held together in a regular spatial arrangement by chemical bonds between the C regions. The antigen recognition pocket is composed of the V regions from one light and one heavy chain; these VL and VH regions sit opposite each other in the linked antibody structure, and each antibody contains two identical antigen recognition pockets (http://www.ultranet.com/~jkimball/BiologyPages/A/AgReceptorDiversity.html). The pair of heavy chain constant regions (CH) at the end of the antibody determine how it interacts with cells in the body. V(D)J joining. There are no functional antibody coding regions transmitted in the mammalian germ line. Each expressed antibody locus has to be constructed from partial sequence components in the germ line chromosomes. The details of the construction process generate the immense variety in antigen recognition pockets that is needed for effective detection of foreign invaders (Gellert 1997; Shapiro 2005). Structure of immunoglobulin-coding DNA and the process of V(D)J joining. The different V, D, J and C exons and the details of the molecular events are explained in (Bassing, Swat et al. 2002)and (Gellert 2002). The differently shaded triangles represent complementary recombination signal sequences (RSSs). For any two exons to join together, they must be flanked by complementary RSSs. Two identical RSSs will not promote DNA breakage and rejoining. Note, in the heavy chain chromosome, how the arrangement of RSSs prevents V-J and D-D joining and effectively prevents further joining activity on the fully rearranged chromosome. The shaded rectangle in the VHj-DHj joining product indicates a segment of “N region” untemplated nucleotides arising from the action of terminal transferase before the broken fragments are ligated together. From (Shapiro 2005) with permission. Men and mice have two kinds of L chains, labeled Kappa (Lk) and Lambda (Ll). For each class of L chain, the germ line contains a single C region exon separated by introns from a set of four short join (J) region exons (JL1, JL2, JL3, JL4). Immediately upstream of the J region exons, no functional transcription signals are present. A considerable distance upstream are a set of about 100-300 V region exons preceded by suitable transcription signals (Vl1, Vl2…V li, V lj…V ly, V lz). A functional L chain coding sequence is constructed by joining one of the V regions to one of the J regions. The joined VJ exon can then be transcribed, and RNA splicing constructs a functional VJC coding sequence that can be translated into an L chain. It should be clear that different Vli –Jln and Vki –Jkn combinations can generate about 400-1200 different L chains of each class. The initial H chains synthesized by B lymphocytes all share the same CHm exon that is preceded by introns and four JHn exons, similar to the arrangement upstream of the CL exons. Again, trancription signals are missing from the region before CHm. Similar to the L chain chromosome, a long distance upstream of CHm there are 100-1000 VH exons. However, here the similarity breaks down. Between the VH and CH regions, there are about a dozen diversity (DHn) segment exons. The murine IgH locus spans approximately 3 Mb near the telomeric end of chromosome 12. There are 150 or more functional VH gene segments arrayed over 2.7 Mb, starting approximately 100 kb upstream of 12–13 DH gene segments. The DH segments are located in a roughly 50 kb region upstream of the four JH gene segments, which are, in turn, located within a 2 kb region starting approximately 700 bp downstream of the closest DH gene segment. Starting with the Cm exons that lie about 7 kb downstream of the JH gene segments, the various constant region exons are spread across 200 kb. The human IgH locus has a similar organization (Jung, Giallourakis et al. 2006). To generate a functional locus encoding an H chain, a DHi exon is joined to one of the JHn exons, and the resulting DHi-JHn-intron- CHm construct is then joined to a VHi exon. The final VHi-DHi-JHn-intron- CHm composite is then capable of transcription and splicing to produce a function H chain of the m class (Jung, Giallourakis et al. 2006). Once a B lymphocyte produces a functional Hm chain, then it can assemble the L chain VJ junctures. When a B lymphocyte produces both H and L chains, the V(D)J joining machinery is shut down. Making our combinatorial calculation again, the VH-DH-JHn joining process can produce about 500 X 12 X 4 = 24,000 different Hm chains. If we allow H and L chains to assemble in all possible pairs, then we have about 24,000 X 2,000 = 48,000,000 different antigen recognition pockets. While this number is quite impressive, it falls several orders of magnitude short of what the immune system needs in antibody diversity. In order to understand where the extra variability comes from, we need to look at the exact mechanisms of V(D)J joining, where we will meet some old natural genetic engineering friends. To carry out V(D)J joining, the lymphocyte has to target DS breaks to the right positions at one or the other end of each V, D and J exon. The protein that makes the DS breaks is a composite of the RAG1 and RAG2 chains. RAG1&2 evolved from a transposase and recognize special recombination signal sequences (RSSs), analogous to one of the terminal inverted repeats on a transposon (Agrawal, Eastman et al. 1998; Hiom, Melek et al. 1998; Fugmann 2001; Neiditch, Lee et al. 2002; Clatworthy, Valencia et al. 2003; Brandt and Roth 2004; Chatterji, Tsai et al. 2004; Jones and Gellert 2004; Zhou, Mitra et al. 2004; Matthews and Oettinger 2009). We know that the RSSs are equivalent to the IR termini of a transposon because they support RAG1&2-mediated transposition in test tubes and in yeast cells when placed in the proper orientations on either side of a DNA segment. The RSSs are positioned appropriately so that the DS breaks occur upstream of J exons, downstream of V exons, and on both sides of D exons. Thus, the lymphocytes have domesticated the RAG1&2 “transposase” to induce DS breaks at the RSSs so that all the appropriate DJ, VDJ and VH joinings can occur in sequence At the H chain locus we know that the order of cleavage and joining reactions reflects the proximity of the different RSS sequences to the nuclear envelope and that VH-DJH joining correlates with movement of the VH region towards the periphery of the nucleus (Kosak, Skok et al. 2002). After RSSs cleavage, the joining reactions involve the regular NHEJ repair machinery (van Gent and van der Burg 2007; Weterings and Chen 2008) or a specialized NHEJ system (Lee, Neiditch et al. 2004; Corneo, Wendland et al. 2007; Yan, Boboila et al. 2007; Dinkelmann, Spehalski et al. 2009). The cleaved DNA adjacent to J, D, and V exons has a special hairpin structure (also seen with many DNA transposons) that is opened at various places, meaning that any two exons can be connected flexibly to generate about one to two dozen different junction sequences. There is also some evidence that mutator DNA polymerases participate in the NHEJ process that connects exons (Lee, Neiditch et al. 2004; Nick McElhinny and Ramsden 2004). This “junctional diversity” at the three DJ, VD and VJ joints adds another three orders of magnitude to the overall variety of possible immunoglobulin structures. In addition to junctional diversity, there is further variability on either side of the D exons in the H chain. This variability comes from the inclusion of what are called “N region nucleotides” in the connections joining the DH exon on either side to JH and VH exons. N region sequences do not come from the germline; they result from oligonucleotide synthesis by the enzyme terminal deoxyribonucleotidyl transferase, which polymerizes DNA without any template (Bentolila, Wu et al. ; Tuaillon and Capra 1998; Benedict, Gilfillan et al. 2000; Tuaillon and Capra 2000). This biological use of completely “synthetic” DNA sequences adds several orders of magnitude to the potential antibody repertoire. By multiplying all sources of variability together (different combinations of V, D and J exons, junctional diversity, and N region nucleotide diversity) for the two chains, we arrive at a final immunoglobulin repertoire of over 1012 possibilities, an amazing number that is evidently large enough to generate antibodies capable of recognizing all invaders. A number of features of antibody coding sequence construction teach us a great deal about how sophisticated cells can be in applying DNA restructuring to adaptive functions: (i) the adaptation of transposition, DS break repair and DNA synthesis activities to a well-defined function, (ii) the precision of generating DS breaks at the right places to produce correctly structure antibodies, and (iii) the integration of DS break precision with several different methods of introducing extraordinary diversity into the final coding sequences. The fact that lymphocytes have a demonstrated capacity to merge genomic targeting with local sequence generation flexibility gives us insight into the kinds of complex genetic changes that may play key roles in creating evolutionary inventions. V region somatic hypermutation. When an IgM antibody encoded by newly constructed H and L sequences first binds an antigen in a lymph node, the binding event stimulates changes in the producer B cell, which begins to proliferate. Proliferation amplifies production of the antigen-recognizing immunoglobulin (Ig). But this initial Ig may be of limited specificity and bond the antigen with low affinity. Accordingly, the activated B cell undergoes a process called “somatic hypermutation” which specifically mutagenizes the H and L chain V regions so that some of them encode antibodies with much higher affinity for the activating antigen (Zan, Cerutti et al. 1999; Nick McElhinny and Ramsden 2004). Somatic hypermutation introduces base substitution mutations. Cells producing higher-affinity antibodies are selected and come to dominate the mature immune response a week or two after the antigen was first introduced. The somatic hypermutation process is remarkable for its efficiency and for the precision of its targeting so that only V region sequences, not C region and not non-immunoglobulon sequences, undergo change. We do not fully understand the somatic hypermutation process or how it is targeted, but a few informative details have been established (Papavasiliou and Schatz 2002). (i) The activated B cells synthesize an “activation-induced cytidine deaminase” (AID) enzyme that is essential for somatic hypermutation (Muramatsu, Kinoshita et al. 2000; Longerich, Basu et al. 2006). AID removes amino groups from C nucleotides in single-stranded DNA and converts them into Us, which are targets for base-excision repair. We hypothesize that AID action recruits repair functions, possibly including mutator polymerases (Cascalho, Wong et al. 1998; Diaz and Storb 2003; Seki, Gearhart et al. 2005; Goodman, Scharff et al. 2007; Liu and Schatz 2009), to participate in somatic hypermutation. (ii) Somatic hypermutation depends on transcription from the immunoglobulin start signals and extends about 2 kb from the start site (Inlay, Gao et al. 2006). If other DNA sequences are placed downstream of the start site, then they are subject to hypermutation, and if the start site is moved next to the C region, then it is mutagenized. Thus, transcription is necessary for somatic hypermutation and acts in coordination with AID, almost certainly because the two DNA strands are separated during transcription (Ramiro, Stavropoulos et al. 2003). (iii) A 9.8 kb sequence has recently been characterized that is essential for somatic hypermutation (Blagodatski, Batrak et al. 2009). This “diversification activator” (DIVAC) DNA segment lies downstream of the mutagenized V region and activates hypermutation when placed downstream of non-immunoglobulin loci in activated B cells. DIVAC appears to have a complex structure, and its mechanism of stimulating hypermutation is unknown. Since we know that AID works broadly around the genome in activated B cells, we may speculate that DIVAC somehow blocks the error-free repair that prevents hypermutation outside the immunoglobulin loci (Liu and Schatz 2009). The existence of DIVAC provides at least the beginnings of an explanation for the restriction of somatic hypermutation to immunoglobulin V region sequences. The theoretical significance of somatic hypermutation is two fold, First, it demonstrates that cells can coordinate transcription signals, DNA-modifying activities like AID, and signals such as the DIVAC element to target highly localized and functionally relevant mutagenesis to a specific genome locus. This capacity has long been denied in conventional evolutionary thinking, and most evolutionists would treat somatic hypermutation as extraordinary and not of general significance. Nonetheless, the fact remains that living cells can, and do, carry out targeted mutagenesis. Consequently, this capability has to be incorporated into evolutionary thinking. The second significance of somatic hypermutation is that it demonstrates that rapid protein evolution occurs in two steps: (i) initial invention of the antigen-binding molecule by V(D)J joining and (ii) subsequent fine-tuning by targeted mutagenesis. This switch between macroevolution to produce something totally novel followed by microevolution to make the novelty work more efficiently may well be paradigmatic for evolution in general. CH class switching. Somatic hypermutation is not the only DNA change targeted to the immunoglobulin loci in activated B cells. Once antibodies with the correct antigen specificity are produced, it is critical to send them to the places and tissues in the body where they can act most effectively. This functional localization independent of antigen specificity is accomplished by the H chain constant region, which confers class type upon the antibody. There are five antibody classes (M, D, G, E, A) with a number of subclasses (McCullough and Summerfield 2005; Saalmuller 2006; Butler, Zhao et al. 2009). The first antibodies produced are IgM molecules with a CHm exon encoding the constant region of the H chains. IgM antibodies sit on the surface of the B cells, where they act as antigen receptors and signal B cell activation when an antigen has been bound. IgD molecules are also membrane bound on B cells and are present at about 1% the level of IgM antibodies. IgD are produced from the same RNA as IgM by an alternative splicing event. IgG antibodies circulate in the bloodstream and the liquids that surround body tissues. They are the dominant antibodies found in serum and mediate the classical adaptive immune response. IgE antibodies are synthesized at very low levels (0.05% the level of IgG) but elicit a very strong immune reaction. IgE is important in allergies and also in defense against parasitic worms and malaria (Pfister, Turner et al. 1983; Calissano, Modiano et al. 2003; Watanabe, Bruschi et al. 2005; Duarte, Deshpande et al. 2007; Erb 2007; Fitzsimmons, McBeath et al. 2007; Tangteerawatana, Montgomery et al. 2007; Leoratti, Durlacher et al. 2008). IgA is a secreted immunoglobulin and plays a major role in mucosal immunity, particular at body orifices and in the intestine (Fagarasan and Honjo 2003; Fagarasan 2008). IgG, IgE and IgA molecules cannot be translated from the initial IgM transcript. In order to produce them, B cells have to replace the CHm exon with a CHg, CHe or CHa exon. Such a “class switch recombination” (CSR) only occurs in activated B cells and is targeted to specific “switch sites” that are located in the DNA upstream of the CHm, CHg, CHe and CHa exons. CSR requires AID activity and occurs by a DS break at the sm and one of the other switch sites, followed by NHEJ-dependent repair (Kinoshita and Honjo 2001; Honjo, Kinoshita et al. 2002; Jolly, Cook et al. 2008; Zan and Casali 2008; Hackney, Misaghi et al. 2009; Wang, Gostissa et al. 2009; Boboila, Yan et al. 2010; Daniel, Santos et al. 2010). Which of the downstream switch sites suffers a DS break is regulated by lymphokine signals from other cells of the immune system. The targeting operates by lymphokine control of promoters immediately upstream of each sg, se, and sa switch site (Zhang 2003; Sellars, Reina-San-Martin et al. 2009). The lymphokine-directed targeting ensures that the appropriate classes of antibody are produced for each individual infection. As in somatic hypermutation, transcription of the switch sites makes them susceptible to AID modification, which creates a region particularly susceptible to DS breakage. The switch sites have a repetitive structure filled with inverted repeats, which endows them with their breakage sensitivity when deaminated. The conceptual importance of class switching lies in the demonstration that DS breaks can be targeted by lymphokine-directed transcription (Honjo, Kinoshita et al. 2002; Sellars, Reina-San-Martin et al.). The integration of intercellular signaling and the transcription it controls with DS breaks and NHEJ provides us with a detailed molecular mechanism for the way communication molecules can direct DNA rearrangements to particular regions of the genome. This is yet another capacity for controlling natural genetic engineering functions that has to be incorporated into our ideas about the genome restructuring tools available for evolution. Class switch recombination, from (Shapiro 2005) with permission. Agrawal, A., Q. M. Eastman, et al. (1998). "Transposition mediated by RAG1 and RAG2 and its implications for the evolution of the immune system." Nature 394(6695): 744-751. http://www.ncbi.nlm.nih.gov/pubmed/9723614. Aguilar, P. S., M. G. Heiman, et al. (2010). "Structure of sterol aliphatic chains affects yeast cell shape and cell fusion during mating." Proc Natl Acad Sci U S A 107(9): 4170-4175. http://www.ncbi.nlm.nih.gov/pubmed/20150508. Alon, U. (2007). "Network motifs: theory and experimental approaches." Nat Rev Genet 8(6): 450-461. http://www.ncbi.nlm.nih.gov/pubmed/17510665. Aravind, L., V. Anantharaman, et al. (2009). "Apprehending multicellularity: regulatory networks, genomics, and evolution." Birth Defects Res C Embryo Today 87(2): 143-164. http://www.ncbi.nlm.nih.gov/pubmed/19530132. Arditti, R. R., J. G. Scaife, et al. (1968). "The nature of mutants in the lac promoter region." J Mol Biol 38(3): 421-426. http://www.ncbi.nlm.nih.gov/pubmed/4887878. Arkowitz, R. A. (2009). "Chemical gradients and chemotropism in yeast." Cold Spring Harb Perspect Biol 1(2): a001958. http://www.ncbi.nlm.nih.gov/pubmed/20066086. Arsene, F., T. Tomoyasu, et al. (2000). "The heat shock response of Escherichia coli." Int J Food Microbiol 55(1-3): 3-9. http://www.ncbi.nlm.nih.gov/pubmed/10791710. Ben-Tabou de-Leon, S. and E. H. Davidson (2007). "Gene regulation: gene control network in development." Annu Rev Biophys Biomol Struct 36: 191. http://www.ncbi.nlm.nih.gov/pubmed/17291181. Ben-Tabou de-Leon, S. and E. H. Davidson (2009). "Modeling the dynamics of transcriptional gene regulatory networks for animal development." Dev Biol 325(2): 317-328. http://www.ncbi.nlm.nih.gov/pubmed/19028486. Benedict, C. L., S. Gilfillan, et al. (2000). "Terminal deoxynucleotidyl transferase and repertoire development." Immunol Rev 175: 150-157. http://www.ncbi.nlm.nih.gov/pubmed/10933600. Bentolila, L. A., G. E. Wu, et al. (1997). "Constitutive expression of terminal deoxynucleotidyl transferase in transgenic mice is sufficient for N region diversity to occur at any Ig locus throughout B cell differentiation." J Immunol 158(2): 715-723. http://www.ncbi.nlm.nih.gov/pubmed/8992987. Blumer, K. J., J. E. Reneke, et al. (1988). "The STE2 gene product is the ligand-binding component of the alpha-factor receptor of Saccharomyces cerevisiae." J Biol Chem 263(22): 10836-10842. http://www.ncbi.nlm.nih.gov/pubmed/2839507. Boboila, C., C. Yan, et al. (2010). "Alternative end-joining catalyzes class switch recombination in the absence of both Ku70 and DNA ligase 4." J Exp Med 207(2): 417-427. http://www.ncbi.nlm.nih.gov/pubmed/20142431. Bonn, S. and E. E. Furlong (2008). "cis-Regulatory networks during development: a view of Drosophila." Curr Opin Genet Dev 18(6): 513-520. http://www.ncbi.nlm.nih.gov/pubmed/18929653. Borok, M. J., D. A. Tran, et al. (2010). "Dissecting the regulatory switches of development: lessons from enhancer evolution in Drosophila." Development 137(1): 5-13. http://www.ncbi.nlm.nih.gov/pubmed/20023155. Brandt, V. L. and D. B. Roth (2004). "V(D)J recombination: how to tame a transposase." Immunol Rev 200: 249-260. http://www.ncbi.nlm.nih.gov/pubmed/15242410. Butler, J. E., Y. Zhao, et al. (2009). "Immunoglobulins, antibody repertoire and B cell development." Dev Comp Immunol 33(3): 321-333. http://www.ncbi.nlm.nih.gov/pubmed/18804488. Calissano, C., D. Modiano, et al. (2003). "IgE antibodies to Plasmodium falciparum and severity of malaria in children of one ethnic group living in Burkina Faso." Am J Trop Med Hyg 69(1): 31-35. http://www.ncbi.nlm.nih.gov/pubmed/12932093. Chatterji, M., C. L. Tsai, et al. (2004). "New concepts in the regulation of an ancient reaction: transposition by RAG1/RAG2." Immunol Rev 200: 261-271. http://www.ncbi.nlm.nih.gov/pubmed/15242411. Chen, R. E. and J. Thorner (2007). "Function and regulation in MAPK signaling pathways: lessons learned from the yeast Saccharomyces cerevisiae." Biochim Biophys Acta 1773(8): 1311-1340. http://www.ncbi.nlm.nih.gov/pubmed/17604854. Chenevert, J. (1994). "Cell polarization directed by extracellular cues in yeast." Mol Biol Cell 5(11): 1169-1175. http://www.ncbi.nlm.nih.gov/pubmed/7865882. Chenevert, J., N. Valtz, et al. (1994). "Identification of genes required for normal pheromone-induced cell polarization in Saccharomyces cerevisiae." Genetics 136(4): 1287-1296. http://www.ncbi.nlm.nih.gov/pubmed/8013906. Chou, S., S. Lane, et al. (2006). "Regulation of mating and filamentation genes by two distinct Ste12 complexes in Saccharomyces cerevisiae." Mol Cell Biol 26(13): 4794-4805. http://www.ncbi.nlm.nih.gov/pubmed/16782869. Clatworthy, A. E., M. A. Valencia, et al. (2003). "V(D)J recombination and RAG-mediated transposition in yeast." Mol Cell 12(2): 489-499. http://www.ncbi.nlm.nih.gov/pubmed/14536087. Cooper, M. B., M. Loose, et al. (2009). "The evolutionary influence of binding site organisation on gene regulatory networks." Biosystems 96(2): 185-193. http://www.ncbi.nlm.nih.gov/pubmed/19428984. Corneo, B., R. L. Wendland, et al. (2007). "Rag mutations reveal robust alternative end joining." Nature 449(7161): 483-486. http://www.ncbi.nlm.nih.gov/pubmed/17898768. Crasnier-Mednansky, M. (2008). "Is there any role for cAMP-CRP in carbon catabolite repression of the Escherichia coli lac operon?" Nat Rev Microbiol 6(12): 954; author reply 954. http://www.ncbi.nlm.nih.gov/pubmed/18955986. Daniel, J. A., M. A. Santos, et al. (2010). "PTIP Promotes Chromatin Changes Critical for Immunoglobulin Class Switch Recombination." Science 329(5994): 917-923. http://www.ncbi.nlm.nih.gov/pubmed/20671152. Davidson, E. H. and D. H. Erwin (2006). "Gene regulatory networks and the evolution of animal body plans." Science 311(5762): 796-800. http://www.ncbi.nlm.nih.gov/pubmed/16469913. De Crombrugghe, B., B. Chen, et al. (1971). "Lac DNA, RNA polymerase and cyclic AMP receptor protein, cyclic AMP, lac repressor and inducer are the essential elements for controlled lac transcription." Nat New Biol 231(22): 139-142. http://www.ncbi.nlm.nih.gov/pubmed/4326354. De Crombrugghe, B., R. L. Perlman, et al. (1969). "Regulation of inducible enzyme synthesis in Escherichia coli by cyclic adenosine 3', 5'-monophosphate." J Biol Chem 244(21): 5828-5835. http://www.ncbi.nlm.nih.gov/pubmed/4310825. De Crombrugghe, E., B. Chen, et al. (1971). "Role of cyclic adenosine 3',5'-monophosphate and the cyclic adenosine 3',5'-monophosphate receptor protein in the initiation of lac transcription." J Biol Chem 246(23): 7343-7348. http://www.ncbi.nlm.nih.gov/pubmed/4333322. De Robertis, E. M., G. Oliver, et al. (1990). "Homeobox genes and the vertebrate body plan." Sci Am 263(1): 46-52. http://www.ncbi.nlm.nih.gov/pubmed/1973846. Diaz, M. and U. Storb (2003). "A novel cytidine deaminase AIDs in the delivery of error-prone polymerases to immunoglobulin genes." DNA Repair (Amst) 2(5): 623-627. http://www.ncbi.nlm.nih.gov/pubmed/12713818. Dinkelmann, M., E. Spehalski, et al. (2009). "Multiple functions of MRN in end-joining pathways during isotype class switching." Nat Struct Mol Biol 16(8): 808-813. http://www.ncbi.nlm.nih.gov/pubmed/19633670. Dohlman, H. G. (2002). "G proteins and pheromone signaling." Annu Rev Physiol 64: 129-152. http://www.ncbi.nlm.nih.gov/pubmed/11826266. Dohlman, H. G. and J. E. Slessareva (2006). "Pheromone signaling pathways in yeast." Sci STKE 2006(364): cm6. http://www.ncbi.nlm.nih.gov/pubmed/17148787. Dolan, J. W. (1996). "Novel aspects of pheromone-induced cell-cycle arrest in yeast." Curr Genet 30(6): 469-475. http://www.ncbi.nlm.nih.gov/pubmed/8939807. Duarte, J., P. Deshpande, et al. (2007). "Total and functional parasite specific IgE responses in Plasmodium falciparum-infected patients exhibiting different clinical status." Malar J 6: 1. http://www.ncbi.nlm.nih.gov/pubmed/17204149. Erb, K. J. (2007). "Helminths, allergic disorders and IgE-mediated immune responses: where do we stand?" Eur J Immunol 37(5): 1170-1173. http://www.ncbi.nlm.nih.gov/pubmed/17447233. Erwin, D. H. and E. H. Davidson (2009). "The evolution of hierarchical gene regulatory networks." Nat Rev Genet 10(2): 141-148. http://www.ncbi.nlm.nih.gov/pubmed/19139764. Esch, R. K., Y. Wang, et al. (2006). "Pheromone-induced degradation of Ste12 contributes to signal attenuation and the specificity of developmental fate." Eukaryot Cell 5(12): 2147-2160. http://www.ncbi.nlm.nih.gov/pubmed/17041188. Fagarasan, S. (2008). "Evolution, development, mechanism and function of IgA in the gut." Curr Opin Immunol 20(2): 170-177. http://www.ncbi.nlm.nih.gov/pubmed/18456485. Fagarasan, S. and T. Honjo (2003). "Intestinal IgA synthesis: regulation of front-line body defences." Nat Rev Immunol 3(1): 63-72. http://www.ncbi.nlm.nih.gov/pubmed/12511876. Fitzsimmons, C. M., R. McBeath, et al. (2007). "Factors affecting human IgE and IgG responses to allergen-like Schistosoma mansoni antigens: Molecular structure and patterns of in vivo exposure." Int Arch Allergy Immunol 142(1): 40-50. http://www.ncbi.nlm.nih.gov/pubmed/17019080. Friedman, B. E., J. S. Olson, et al. (1977). "Interaction of lac repressor with inducer, kinetic and equilibrium measurements." J Mol Biol 111(1): 27-39. http://www.ncbi.nlm.nih.gov/pubmed/16140. Fugmann, S. D. (2001). "RAG1 and RAG2 in V(D)J recombination and transposition." Immunol Res 23(1): 23-39. http://www.ncbi.nlm.nih.gov/pubmed/11417858. Gonzalez Perez, A. D., E. Gonzalez Gonzalez, et al. (2008). "Impact of Transcription Units rearrangement on the evolution of the regulatory network of gamma-proteobacteria." BMC Genomics 9: 128. http://www.ncbi.nlm.nih.gov/pubmed/18366643. Goodman, M. F., M. D. Scharff, et al. (2007). "AID-initiated purposeful mutations in immunoglobulin genes." Adv Immunol 94: 127-155. http://www.ncbi.nlm.nih.gov/pubmed/17560274. Gramzow, L., M. S. Ritz, et al. (2010). "On the origin of MADS-domain transcription factors." Trends Genet 26(4): 149-153. http://www.ncbi.nlm.nih.gov/pubmed/20219261. Grimm, S. L. and S. K. Nordeen (1999). "A composite enhancer element directing tissue-specific expression of mouse mammary tumor virus requires both ubiquitous and tissue-restricted factors." J Biol Chem 274(18): 12790-12796. http://www.ncbi.nlm.nih.gov/pubmed/10212264. Gustin, M. C., J. Albertyn, et al. (1998). "MAP kinase pathways in the yeast Saccharomyces cerevisiae." Microbiol Mol Biol Rev 62(4): 1264-1300. http://www.ncbi.nlm.nih.gov/pubmed/9841672. Hackney, J. A., S. Misaghi, et al. (2009). "DNA targets of AID evolutionary link between antibody somatic hypermutation and class switch recombination." Adv Immunol 101: 163-189. http://www.ncbi.nlm.nih.gov/pubmed/19231595. Haerty, W., C. Artieri, et al. (2008). "Comparative analysis of function and interaction of transcription factors in nematodes: extensive conservation of orthology coupled to rapid sequence evolution." BMC Genomics 9: 399. http://www.ncbi.nlm.nih.gov/pubmed/18752680. Harwood, J. P., C. Gazdar, et al. (1976). "Involvement of the glucose enzymes II of the sugar phosphotransferase system in the regulation of adenylate cyclase by glucose in Escherichia coli." J Biol Chem 251(8): 2462-2468. http://www.ncbi.nlm.nih.gov/pubmed/177417. Hengge-Aronis, R. (2002). "Recent insights into the general stress response regulatory network in Escherichia coli." J Mol Microbiol Biotechnol 4(3): 341-346. http://www.ncbi.nlm.nih.gov/pubmed/11931567. Hickey, A. J., E. Conway de Macario, et al. (2002). "Transcription in the archaea: basal factors, regulation, and stress-gene expression." Crit Rev Biochem Mol Biol 37(6): 537-599. http://www.ncbi.nlm.nih.gov/pubmed/12540196. Hinman, V. F., A. Nguyen, et al. (2007). "Caught in the evolutionary act: precise cis-regulatory basis of difference in the organization of gene networks of sea stars and sea urchins." Dev Biol 312(2): 584-595. http://www.ncbi.nlm.nih.gov/pubmed/17956756. Hinman, V. F., K. A. Yankura, et al. (2009). "Evolution of gene regulatory network architectures: examples of subcircuit conservation and plasticity between classes of echinoderms." Biochim Biophys Acta 1789(4): 326-332. http://www.ncbi.nlm.nih.gov/pubmed/19284985. Hiom, K., M. Melek, et al. (1998). "DNA transposition by the RAG1 and RAG2 proteins: a possible source of oncogenic translocations." Cell 94(4): 463-470. http://www.ncbi.nlm.nih.gov/pubmed/9727489. Ho, M. C., H. Johnsen, et al. (2009). "Functional evolution of cis-regulatory modules at a homeotic gene in Drosophila." PLoS Genet 5(11): e1000709. http://www.ncbi.nlm.nih.gov/pubmed/19893611. Hu, B., W. J. Rappel, et al. (2009). "Mechanisms and constraints on yeast MAPK signaling specificity." Biophys J 96(12): 4755-4763. http://www.ncbi.nlm.nih.gov/pubmed/19527636. Huber, R. E., G. Kurz, et al. (1976). "A quantitation of the factors which affect the hydrolase and transgalactosylase activities of beta-galactosidase (E. coli) on lactose." Biochemistry 15(9): 1994-2001. http://www.ncbi.nlm.nih.gov/pubmed/5122. Huber, R. E., K. Wallenfels, et al. (1975). "The action of beta-galactosidase (Escherichia coli) on allolactose." Can J Biochem 53(9): 1035-1038. http://www.ncbi.nlm.nih.gov/pubmed/241475. Inada, T., K. Kimata, et al. (1996). "Mechanism responsible for glucose-lactose diauxie in Escherichia coli: challenge to the cAMP model." Genes Cells 1(3): 293-301. http://www.ncbi.nlm.nih.gov/pubmed/9133663. Jacob, F. and J. Monod (1961). "Genetic regulatory mechanisms in the synthesis of proteins." J Mol Biol 3: 318-356. http://www.ncbi.nlm.nih.gov/pubmed/13718526\. Jacob, F., D. Perrin, et al. (1960). "Operon: a group of genes with the expression oordinated by an operator." C. R. Hebd. Seances Acad. Sci 250: 1727–1729. .
Jolly, C. J., A. J. Cook, et al. (2008). "Fixing DNA breaks during class switch recombination." J Exp Med 205(3): 509-513. http://www.ncbi.nlm.nih.gov/pubmed/18332183\. Jones, J. M. and M. Gellert (2004). "The taming of a transposon: V(D)J recombination and the immune system." Immunol Rev 200: 233-248. http://www.ncbi.nlm.nih.gov/pubmed/15242409. Josefsson, L. G. (1999). "Evidence for kinship between diverse G-protein coupled receptors." Gene 239(2): 333-340. http://www.ncbi.nlm.nih.gov/pubmed/10548735. Jung, D., C. Giallourakis, et al. (2006). "Mechanism and control of V(D)J recombination at the immunoglobulin heavy chain locus." Annu Rev Immunol 24: 541-570. http://www.ncbi.nlm.nih.gov/pubmed/16551259. Kimata, K., H. Takahashi, et al. (1997). "cAMP receptor protein-cAMP plays a crucial role in glucose-lactose diauxie by activating the major glucose transporter gene in Escherichia coli." Proc Natl Acad Sci U S A 94(24): 12914-12919. http://www.ncbi.nlm.nih.gov/pubmed/9371775. Kirkman-Correia, C., I. L. Stroke, et al. (1993). "Functional domains of the yeast STE12 protein, a pheromone-responsive transcriptional activator." Mol Cell Biol 13(6): 3765-3772. http://www.ncbi.nlm.nih.gov/pubmed/8497278. Klauck, E., A. Typas, et al. (2007). "The sigmaS subunit of RNA polymerase as a signal integrator and network master regulator in the general stress response in Escherichia coli." Sci Prog 90(Pt 2-3): 103-127. http://www.ncbi.nlm.nih.gov/pubmed/17725229. Koelle, M. R. (2006). "Heterotrimeric G protein signaling: Getting inside the cell." Cell 126(1): 25-27. http://www.ncbi.nlm.nih.gov/pubmed/16839871. Kosak, S. T., J. A. Skok, et al. (2002). "Subnuclear compartmentalization of immunoglobulin loci during lymphocyte development." Science 296(5565): 158-162. .
Kosko, B. and S. Isaka (1993). "Fuzzy Logic." Scientific American 269(1): 76-81. .
Kuhlman, T., Z. Zhang, et al. (2007). "Combinatorial transcriptional control of the lactose operon of Escherichia coli." Proc Natl Acad Sci U S A 104(14): 6043-6048. http://www.ncbi.nlm.nih.gov/pubmed/17376875. Kundig, W., S. Ghosh, et al. (1964). "Phosphate Bound to Histidine in a Protein as an Intermediate in a Novel Phospho-Transferase System." Proc Natl Acad Sci U S A 52: 1067-1074. http://www.ncbi.nlm.nih.gov/pubmed/14224387. Kusari, A. B., D. M. Molina, et al. (2004). "A conserved protein interaction network involving the yeast MAP kinases Fus3 and Kss1." J Cell Biol 164(2): 267-277. http://www.ncbi.nlm.nih.gov/pubmed/14734536. Lee, B. N. and E. A. Elion (1999). "The MAPKKK Ste11 regulates vegetative growth through a kinase cascade of shared signaling components." Proc Natl Acad Sci U S A 96(22): 12679-12684. http://www.ncbi.nlm.nih.gov/pubmed/10535982. Lee, G. S., M. B. Neiditch, et al. (2004). "RAG proteins shepherd double-strand breaks to a specific pathway, suppressing error-prone repair, but RAG nicking initiates homologous recombination." Cell 117(2): 171-184. http://www.ncbi.nlm.nih.gov/pubmed/15084256. Leoratti, F. M., R. R. Durlacher, et al. (2008). "Pattern of humoral immune response to Plasmodium falciparum blood stages in individuals presenting different clinical expressions of malaria." Malar J 7: 186. http://www.ncbi.nlm.nih.gov/pubmed/18816374. Lesage, G. and H. Bussey (2006). "Cell wall assembly in Saccharomyces cerevisiae." Microbiol Mol Biol Rev 70(2): 317-343. http://www.ncbi.nlm.nih.gov/pubmed/16760306. Levine, M. and E. H. Davidson (2005). "Gene regulatory networks for development." Proc Natl Acad Sci U S A 102(14): 4936-4942. http://www.ncbi.nlm.nih.gov/pubmed/15788537. Li, E. and E. H. Davidson (2009). "Building developmental gene regulatory networks." Birth Defects Res C Embryo Today 87(2): 123-130. http://www.ncbi.nlm.nih.gov/pubmed/19530131. Liu, M. and D. G. Schatz (2009). "Balancing AID and DNA repair during somatic hypermutation." Trends Immunol\ 30(4): 173-181. http://www.ncbi.nlm.nih.gov/pubmed/19303358. Longerich, S., U. Basu, et al. (2006). "AID in somatic hypermutation and class switch recombination." Curr Opin Immunol 18(2): 164-174. http://www.ncbi.nlm.nih.gov/pubmed/16464563. MacArthur, S., X. Y. Li, et al. (2009). "Developmental roles of 21 Drosophila transcription factors are determined by quantitative differences in binding to an overlapping set of thousands of genomic regions." Genome Biol 10(7): R80. http://www.ncbi.nlm.nih.gov/pubmed/19627575. Madan Babu, M., S. A. Teichmann, et al. (2006). "Evolutionary dynamics of prokaryotic transcriptional regulatory networks." J Mol Biol 358(2): 614-633. http://www.ncbi.nlm.nih.gov/pubmed/16530225. Mangan, S. and U. Alon (2003). "Structure and function of the feed-forward loop network motif." Proc Natl Acad Sci U S A 100(21): 11980-11985. http://www.ncbi.nlm.nih.gov/pubmed/14530388. Matthews, A. G. and M. A. Oettinger (2009). "Regulation of RAG transposition." Adv Exp Med Biol 650: 16-31. http://www.ncbi.nlm.nih.gov/pubmed/19731798. McCullough, K. C. and A. Summerfield (2005). "Basic concepts of immune response and defense development." Ilar J 46(3): 230-240. http://www.ncbi.nlm.nih.gov/pubmed/15953831. Mishra, N. S., R. Tuteja, et al. (2006). "Signaling through MAP kinase networks in plants." Arch Biochem Biophys 452(1): 55-68. http://www.ncbi.nlm.nih.gov/pubmed/16806044. Monod, J. and M. Cohn (1952). "[Biosynthesis induced by enzymes; enzymatic adaptation.]." Adv Enzymol Relat Subj Biochem 13: 67-119. http://www.ncbi.nlm.nih.gov/pubmed/14943665. Muller, J., S. Oehler, et al. (1996). "Repression of lac promoter as a function of distance, phase and quality of an auxiliary lac operator." J Mol Biol 257(1): 21-29. http://www.ncbi.nlm.nih.gov/pubmed/8632456. Muramatsu, M., K. Kinoshita, et al. (2000). "Class switch recombination and hypermutation require activation-induced cytidine deaminase (AID), a potential RNA editing enzyme." Cell 102(5): 553-563. http://www.ncbi.nlm.nih.gov/pubmed/11007474. Narang, A. (2009). "cAMP does not have an important role in carbon catabolite repression of the Escherichia coli lac operon." Nat Rev Microbiol 7(3): 250. http://www.ncbi.nlm.nih.gov/pubmed/19230236. Narang, A. (2009). "Quantitative effect and regulatory function of cyclic adenosine 5'-phosphate in Escherichia coli." J Biosci 34(3): 445-463. http://www.ncbi.nlm.nih.gov/pubmed/19805906. Neiditch, M. B., G. S. Lee, et al. (2002). "The V(D)J recombinase efficiently cleaves and transposes signal joints." Mol Cell 9(4): 871-878. http://www.ncbi.nlm.nih.gov/pubmed/11983177. Nick McElhinny, S. A. and D. A. Ramsden (2004). "Sibling rivalry: competition between Pol X family members in V(D)J recombination and general double strand break repair." Immunol Rev 200: 156-164. http://www.ncbi.nlm.nih.gov/pubmed/15242403. Nisseley, S. P., W. B. Anderson, et al. (1971). "In vitro transcription of the gal operon requires cyclic adenosine monophosphate and cyclic adenosine monophosphate receptor protein." J Biol Chem 246(15): 4671-4678. http://www.ncbi.nlm.nih.gov/pubmed/4327324. Nomoto, S., N. Nakayama, et al. (1990). "Regulation of the yeast pheromone response pathway by G protein subunits." Embo J 9(3): 691-696. http://www.ncbi.nlm.nih.gov/pubmed/2107073. Nusslein-Volhard, C. (1996). "Gradients that organize embryo development." Sci Am 275(2): 54-55; 58-61. http://www.ncbi.nlm.nih.gov/pubmed/8693324. Nusslein-Volhard, C. and E. Wieschaus (1980). "Mutations affecting segment number and polarity in Drosophila." Nature 287(5785): 795-801. http://www.ncbi.nlm.nih.gov/pubmed/6776413. Paliwal, S., P. A. Iglesias, et al. (2007). "MAPK-mediated bimodal gene expression and adaptive gradient sensing in yeast." Nature 446(7131): 46-51. http://www.ncbi.nlm.nih.gov/pubmed/17310144. Papavasiliou, F. N. and D. G. Schatz (2002). "Somatic hypermutation of immunoglobulin genes: merging mechanisms for genetic diversity." Cell 109 Suppl: S35-44. http://www.ncbi.nlm.nih.gov/pubmed/11983151. Pastan, I. and R. Perlman (1970). "Cyclic adenosine monophosphate in bacteria." Science 169(943): 339-344. http://www.ncbi.nlm.nih.gov/pubmed/4317896. Pastan, I. and R. L. Perlman (1972). "Regulation of gene transcription in Escherichia coli by cyclic AMP." Adv Cyclic Nucleotide Res 1: 11-16. http://www.ncbi.nlm.nih.gov/pubmed/4353161. Perlman, R. L., B. De Crombrugghe, et al. (1969). "Cyclic AMP regulates catabolite and transient repression in E. coli." Nature 223(5208): 810-812. http://www.ncbi.nlm.nih.gov/pubmed/4307969. Perlman, R. L. and I. Pastan (1968). "Regulation of beta-galactosidase synthesis in Escherichia coli by cyclic adenosine 3',5'-monophosphate." J Biol Chem 243(20): 5420-5427. http://www.ncbi.nlm.nih.gov/pubmed/4302785. Peterkofsky, A. (1988). "Redistribution of phosphate pools and the regulation of Escherichia coli adenylate cyclase activity." Arch Biochem Biophys 265(2): 227-233. http://www.ncbi.nlm.nih.gov/pubmed/2844115. Pfister, K., K. Turner, et al. (1983). "IgE production in rat fascioliasis." Parasite Immunol 5(6): 587-593. http://www.ncbi.nlm.nih.gov/pubmed/6657297. Pinney, J. W., G. D. Amoutzias, et al. (2007). "Reconstruction of ancestral protein interaction networks for the bZIP transcription factors." Proc Natl Acad Sci U S A 104(51): 20449-20453. http://www.ncbi.nlm.nih.gov/pubmed/18077348. Pirkkala, L., P. Nykanen, et al. (2001). "Roles of the heat shock transcription factors in regulation of the heat shock response and beyond." Faseb J 15(7): 1118-1131. http://www.ncbi.nlm.nih.gov/pubmed/11344080. Ramiro, A. R., P. Stavropoulos, et al. (2003). "Transcription enhances AID-mediated cytidine deamination by exposing single-stranded DNA on the nontemplate strand." Nat Immunol 4(5): 452-456. http://www.ncbi.nlm.nih.gov/pubmed/12692548. Roseman, S. (1969). "The transport of carbohydrates by a bacterial phosphotransferase system." J Gen Physiol 54(1): 138-184. http://www.ncbi.nlm.nih.gov/pubmed/19873641. Saalmuller, A. (2006). "New understanding of immunological mechanisms." Vet Microbiol 117(1): 32-38. http://www.ncbi.nlm.nih.gov/pubmed/16701965. Samaj, J., F. Baluska, et al. (2004). "From signal to cell polarity: mitogen-activated protein kinases as sensors and effectors of cytoskeleton dynamicity." J Exp Bot 55(395): 189-198. http://www.ncbi.nlm.nih.gov/pubmed/14673033. Savery, N., V. Rhodius, et al. (1996). "Protein-protein interactions during transcription activation: the case of the Escherichia coli cyclic AMP receptor protein." Philos Trans R Soc Lond B Biol Sci 351(1339): 543-550. http://www.ncbi.nlm.nih.gov/pubmed/8735277. Scaife, J. and J. R. Beckwith (1966). "Mutational alteration of the maximal level of Lac operon expression." Cold Spring Harb Symp Quant Biol 31: 403-408. http://www.ncbi.nlm.nih.gov/pubmed/4866390. Schwacke, J. H. and E. O. Voit (2007). "The potential for signal integration and processing in interacting MAP kinase cascades." J Theor Biol 246(4): 604-620. http://www.ncbi.nlm.nih.gov/pubmed/17337011. Seki, M., P. J. Gearhart, et al. (2005). "DNA polymerases and somatic hypermutation of immunoglobulin genes." EMBO Rep 6(12): 1143-1148. http://www.ncbi.nlm.nih.gov/pubmed/16319960. Sellars, M., B. Reina-San-Martin, et al. (2009). "Ikaros controls isotype selection during immunoglobulin class switch recombination." J Exp Med 206(5): 1073-1087. http://www.ncbi.nlm.nih.gov/pubmed/19414557. Shapiro, J. A. (2005). "A 21st century view of evolution: genome system architecture, repetitive DNA, and natural genetic engineering." Gene 345(1): 91-100. http://www.ncbi.nlm.nih.gov/pubmed/15716117. Silverstone, A. E., B. Magasanik, et al. (1969). "Catabolite sensitive site of the lac operon." Nature 221(5185): 1012-1014. http://www.ncbi.nlm.nih.gov/pubmed/4886742. Simoni, R. D., M. Levinthal, et al. (1967). "Genetic evidence for the role of a bacterial phosphotransferase system in sugar transport." Proc Natl Acad Sci U S A 58(5): 1963-1970. http://www.ncbi.nlm.nih.gov/pubmed/4866983. Slessareva, J. E. and H. G. Dohlman (2006). "G protein signaling in yeast: new components, new connections, new compartments." Science 314(5804): 1412-1413. http://www.ncbi.nlm.nih.gov/pubmed/17138892. Song, D., J. W. Dolan, et al. (1991). "Pheromone-dependent phosphorylation of the yeast STE12 protein correlates with transcriptional activation." Genes Dev 5(5): 741-750. http://www.ncbi.nlm.nih.gov/pubmed/2026326. Sprague, G. F., Jr. (1991). "Signal transduction in yeast mating: receptors, transcription factors, and the kinase connection." Trends Genet 7(11-12): 393-398. http://www.ncbi.nlm.nih.gov/pubmed/1668192. Stock, J. B., E. B. Waygood, et al. (1982). "Sugar transport by the bacterial phosphotransferase system. The glucose receptors of the Salmonella typhimurium phosphotransferase system." J Biol Chem 257(23): 14543-14552. http://www.ncbi.nlm.nih.gov/pubmed/6292227. Tangteerawatana, P., S. M. Montgomery, et al. (2007). "Differential regulation of IgG subclasses and IgE antimalarial antibody responses in complicated and uncomplicated Plasmodium falciparum malaria." Parasite Immunol 29(9): 475-483. http://www.ncbi.nlm.nih.gov/pubmed/17727571. Tjian, R. (1995). "Molecular Machines that Control Genes." Scientific American 272(2): 54-61. http://www.ncbi.nlm.nih.gov/pubmed/ 7817187. Tuaillon, N. and J. D. Capra (1998). "Use of D gene segments with irregular spacers in terminal deoxynucleotidyltransferase (TdT)+/+ and TdT-/- mice carrying a human Ig heavy chain transgenic minilocus." Proc Natl Acad Sci U S A 95(4): 1703-1708. http://www.ncbi.nlm.nih.gov/pubmed/9465080. Tuaillon, N. and J. D. Capra (2000). "Evidence that terminal deoxynucleotidyltransferase expression plays a role in Ig heavy chain gene segment utilization." J Immunol 164(12): 6387-6397. http://www.ncbi.nlm.nih.gov/pubmed/10843694. Turner, C. L. and R. E. Huber (1977). "Differential binding of allolactose anomers to the lactose repressor of Escherichia coli." J Mol Biol 115(2): 195-199. http://www.ncbi.nlm.nih.gov/pubmed/338908. van Drogen, F. and M. Peter (2001). "MAP kinase dynamics in yeast." Biol Cell 93(1-2): 63-70. http://www.ncbi.nlm.nih.gov/pubmed/11730324. van Gent, D. C. and M. van der Burg (2007). "Non-homologous end-joining, a sticky affair." Oncogene 26(56): 7731-7740. http://www.ncbi.nlm.nih.gov/pubmed/18066085. Veitia, R. A. (2008). "One thousand and one ways of making functionally similar transcriptional enhancers." Bioessays 30(11-12): 1052-1057. http://www.ncbi.nlm.nih.gov/pubmed/18937349. Wallrath, L. L., Q. Lu, et al. (1994). "Architectural variations of inducible eukaryotic promoters: preset and remodeling chromatin structures." Bioessays 16(3): 165-170. http://www.ncbi.nlm.nih.gov/pubmed/8166669. Wang, J. H., M. Gostissa, et al. (2009). "Mechanisms promoting translocations in editing and switching peripheral B cells." Nature 460(7252): 231-236. http://www.ncbi.nlm.nih.gov/pubmed/19587764. Wang, Y. and H. G. Dohlman (2002). "Pheromone-dependent ubiquitination of the mitogen-activated protein kinase kinase Ste7." J Biol Chem 277(18): 15766-15772. http://www.ncbi.nlm.nih.gov/pubmed/11864977. Wang, Y. and H. G. Dohlman (2006). "Pheromone-regulated sumoylation of transcription factors that mediate the invasive to mating developmental switch in yeast." J Biol Chem 281(4): 1964-1969. http://www.ncbi.nlm.nih.gov/pubmed/16306045. Wang, Y. and H. G. Dohlman (2006). "Regulation of G protein and mitogen-activated protein kinase signaling by ubiquitination: insights from model organisms." Circ Res 99(12): 1305-1314. http://www.ncbi.nlm.nih.gov/pubmed/17158346. Watanabe, N., F. Bruschi, et al. (2005). "IgE: a question of protective immunity in Trichinella spiralis infection." Trends Parasitol 21(4): 175-178. http://www.ncbi.nlm.nih.gov/pubmed/15780839. Weterings, E. and D. J. Chen (2008). "The endless tale of non-homologous end-joining." Cell Res 18(1): 114-124. http://www.ncbi.nlm.nih.gov/pubmed/18166980. Wu, R., C. P. Bahl, et al. (1978). "Lactose operator--repressor interaction." Curr Top Cell Regul 13: 137-178. http://www.ncbi.nlm.nih.gov/pubmed/352620. Yan, C. T., C. Boboila, et al. (2007). "IgH class switching and translocations use a robust non-classical end-joining pathway." Nature 449(7161): 478-482. http://www.ncbi.nlm.nih.gov/pubmed/17713479. Yin, D., E. Shumay, et al. (2006). "Yeast Ste2 receptors as tools for study of mammalian protein kinases and adaptors involved in receptor trafficking." J Mol Signal 1: 2. http://www.ncbi.nlm.nih.gov/pubmed/17224079. Zan, H. and P. Casali (2008). "AID- and Ung-dependent generation of staggered double-strand DNA breaks in immunoglobulin class switch DNA recombination: a post-cleavage role for AID." Mol Immunol 46(1): 45-61. http://www.ncbi.nlm.nih.gov/pubmed/18760480. Zan, H., A. Cerutti, et al. (1999). "Induction of Ig somatic hypermutation and class switching in a human monoclonal IgM+ IgD+ B cell line in vitro: definition of the requirements and modalities of hypermutation." J Immunol 162(6): 3437-3447. http://www.ncbi.nlm.nih.gov/pubmed/10092799. Zhang, K. (2003). "Accessibility control and machinery of immunoglobulin class switch recombination." J Leukoc Biol 73(3): 323-332. .
Zhou, L., R. Mitra, et al. (2004). "Transposition of hAT elements links transposable elements and V(D)J recombination." Nature 432(7020): 995-1001. http://www.ncbi.nlm.nih.gov/pubmed/15616554. Zinzen, R. P., C. Girardot, et al. (2009). "Combinatorial binding predicts spatio-temporal cis-regulatory activity." Nature 462(7269): 65-70. http://www.ncbi.nlm.nih.gov/pubmed/19890324.